Summer Bucket List | the every things. Here in Indiana we didn't have a "bad winter" really, it was just LONG. Lord, did we need some warmth in a bad way. My mood needed it, & the girls need to RUN. The past several weeks have been "summer warm" & we have taken full advantage. We have spent from morning til evening outside. My shoulders are a testament to that, they are FRIED. Kennedy for one has a much better attitude, she is a different child after being able to run & play out all that energy she has built up! Kensley loves it too, she really getting to experience it for the first time since she was a itty bitty last summer! Now that she is walking, she is constantly trying to keep up with her sister! & doing a great job trying! That & I totally love summer clothes; dressing the girls every morning is so fun, but really when isn't it? 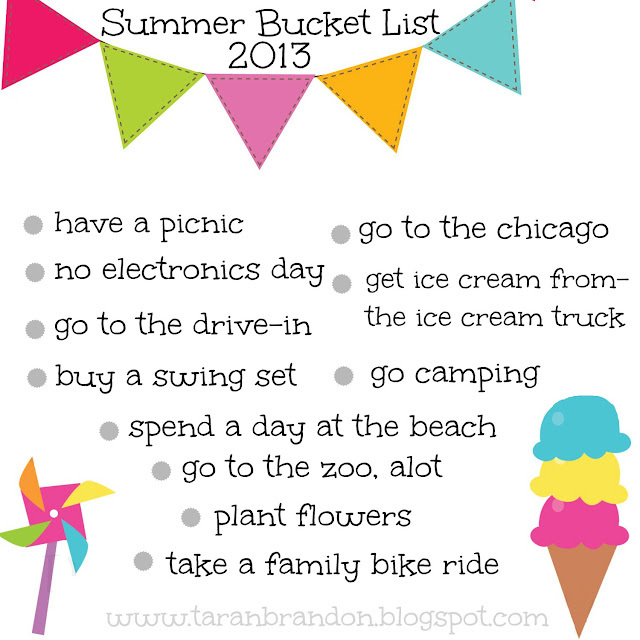 So since I am actually blogging & be consistent I give you our Summer Bucket List of 2013. Where I will be updating every time we cross one off! It is gonna look alot like last years, but its going to be alot easier now that Kensley is older! I love it :) I'm debating doing another summer bucket list, too. I also have the whole day zero thing going on, sooo... not sure. I think I might do one still, and it'll be just family related things. We shall see!